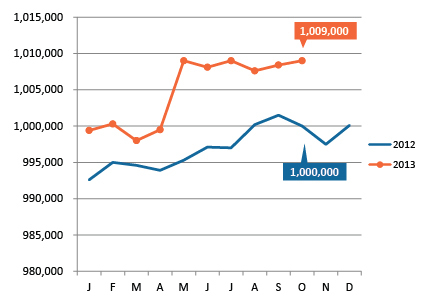 We are still catching up on our local employment data in the wake of the government shutdown. This analysis uses October 2013 data. Seasonally adjusted employment edged up for the second straight month and now stands at 1,009,000, up by 9,000 from October 2012. The local seasonally adjusted unemployment rate has declined for the second straight month and now sits at 6.3 percent. 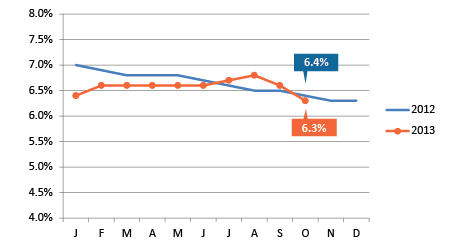 This is barely down from one year ago (6.4 percent) but it marks the lowest point so far in 2013. The 6.3 percent unemployment rate puts us in the lower half of our 13 peer metros; only five have a lower unemployment rate than Kansas City. Job posting activity spiked in October, with more than 16,000 unique help wanted ads in the region. While these local numbers look pretty good, they are overshadowed by strong improvement in the national numbers released on Dec. 6. The nation added 203,000 jobs in November, dropping the unemployment rate to an even 7 percent. While national employment numbers haven’t yet reached pre-recession highs, they are getting close. The nation is on pace to regain all the jobs lost during the recession by the middle of 2014. Local employment remains solid, with 9,000 more jobs than one year ago. The unemployment rate dropped to its lowest point of the year, 6.3 percent. 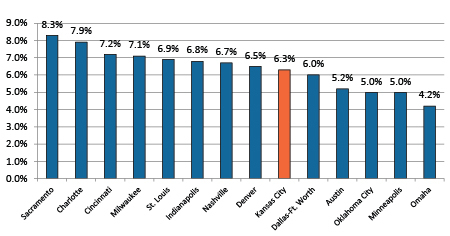 Kansas City's unemployment rate falls in the lower half of our peer metro group. 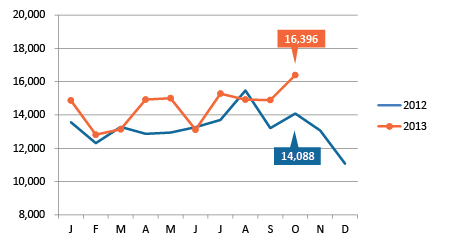 Job postings spiked in October, to 16,396. Kansas City’s Mining, Logging and Construction industry (the vast majority of which is construction employment) increased by 8.1 percent (3,300 jobs) between October 2012 and October 2013. As we have mentioned before, construction employment took a big hit during the recession and has been slow to recover, so this is certainly welcome news. Most local industries saw employment increases over one year ago. The only exceptions are retail and federal and state government employment. Federal government employment fell to 23,900, marking its lowest point since at least 1990.